I need some help with this project, where I am comming up with 3 different wavy designs. I was thinking about another way of doing the pattern instead of what I am doing now, so I have more control over the pattern, instead of just randomize it. 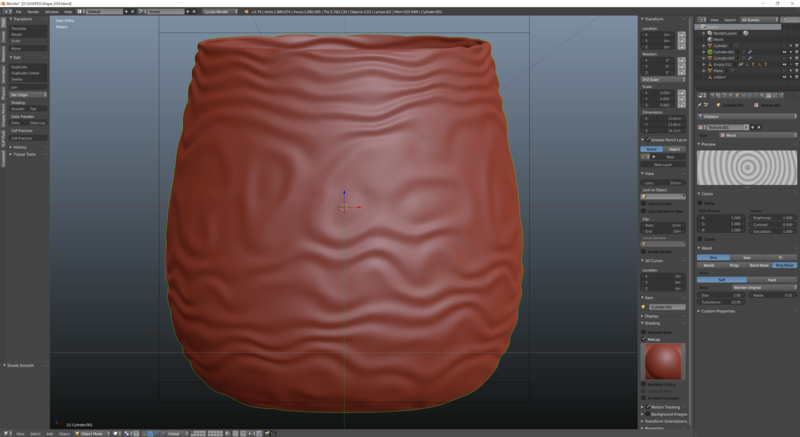 The blender displacement modifiers are nice, and work well, but I can rotate the pattern or anything on the pot, or adjust they way it is projected on the pot. I would like to adjust the size of the waves, aswell as the rotations. Do anyone know if there is a easier/better way of doing something like this in blender? Because otherwise I would have to model it manually which would take ages. Hope you can help me. Browse other questions tagged modifiers displacement texture-coordinates or ask your own question. Is it possible to prevent a Displacement modifier from affecting certain parts of a mesh? How can I invert the areas covered by my diffuse pattern? How to make a grid of objects with individual rotations? Need help with displacement mapping please!